Low interest rates are not popular with fund managers. A prominent bond fund manager, for example, thinks that "central banks are 'distorting' capitalism by keeping interest rates ultra low and causing returns on investment to dwindle. Central banks are pushing each other out of the way in a race to the bottom of interest rates" (Financial Times: Central Banks Distorting Capitalism). Other fund managers contend that low rates severely hurt savers: "Zero (and even negative) interest rates serve to cripple those that now depend on a reasonable interest rate to produce an equitable amount of interest income, which is needed to sustain a consistent life style expectation and, in many cases, funding retirement" (post). Are these views fair? Are interest rates unreasonably low and do they harm those most in need? Among other things, interest rates reflect expectations about inflation and growth: lower inflation and growth will lead to lower interest rates. In the early 1980s, 10 year yields were 16%; at the same time, inflation was 11%. Today, yields are under 2% and so is inflation. The market expects low inflation to continue. 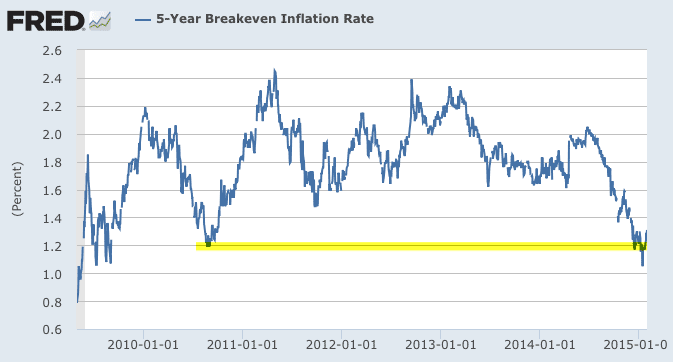 The difference between 5 year treasury yields and 5 year inflation protected treasury yields (known as the 5 year breakeven rate) is just 1%, and it has been falling. In other words, the market expects inflation of just 1% over the next 5 years. 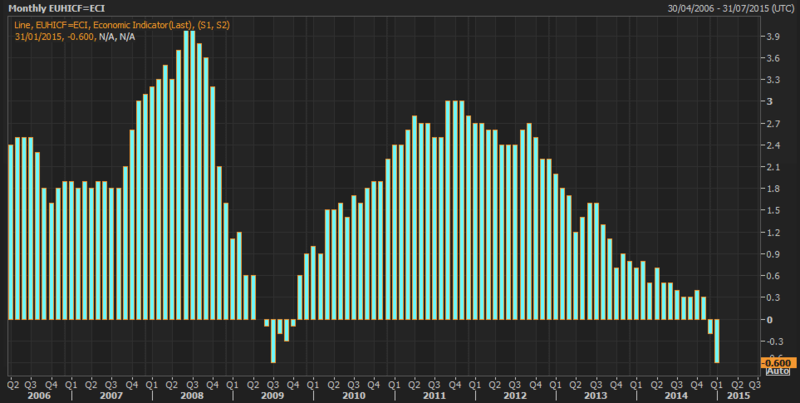 The only time it has been this low, outside of the recession, was in the autumn of 2010. 5 year yields in the autumn of 2010 were roughly the same as they are now. It's hard to say that current rates are unusually low now without also saying they were too low then. Rates were even lower than today during most of 2011 and 2013 and for all of 2012. To get a longer term view of inflation-adjusted yields, we can subtract annualized inflation from nominal yields. 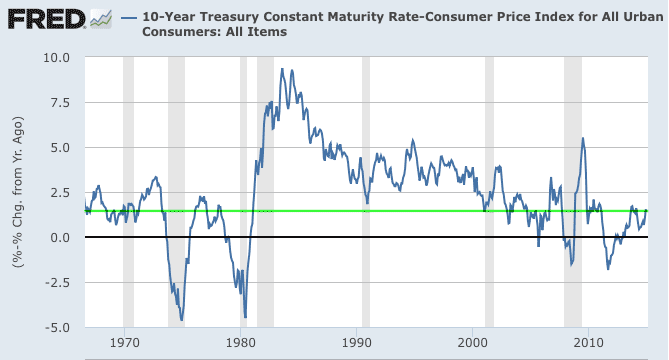 It's admittedly imperfect since actual inflation is historical while yields should be forward looking. Nevertheless, this tells a similar story. Real yields are lower now than during 1980s and 1990s but are in line with yields during the 2000s and also with parts of the 1960s and 1970s. Current yields on this basis are not an obvious outlier. That real yields are lower now than during the 1980s and 1990s should not be surprising: economic growth during those periods was substantially higher. 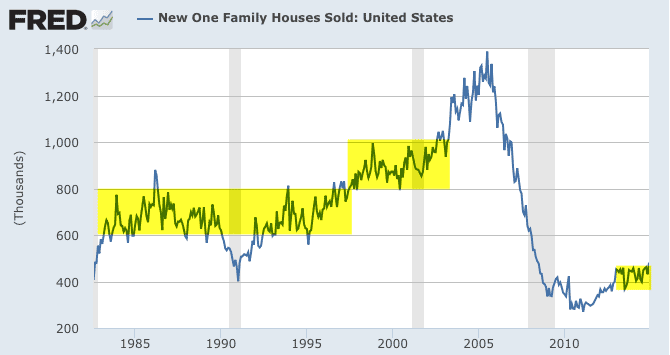 For example, new home sales were twice today's levels. 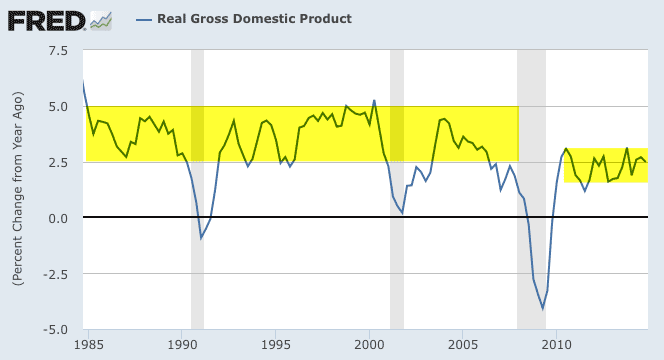 GDP growth in the 1980s and 1990s was also twice as rapid as it is today. Both homes sales and GDP growth were higher in the 2000s than now yet real rates are similar. If anything, one would expect rates to be lower now. We are in a slow growth, low inflation environment, which means there is nothing abnormal about the current level of rates. As Jeff Gundlach accurately stated last week, "there's no fundamental reason" to believe rates should be higher. Moreover, tepid growth outside the U.S. and a stronger dollar, which lower the dollar value of imported goods and makes U.S. exports less competitive, are further causes of concern (article). European rates are even lower than in the U.S., reflecting poor growth and negative inflation. 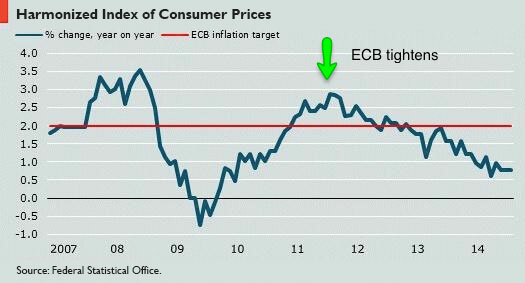 The first chart below is Euro-area inflation, which is now at a record low. 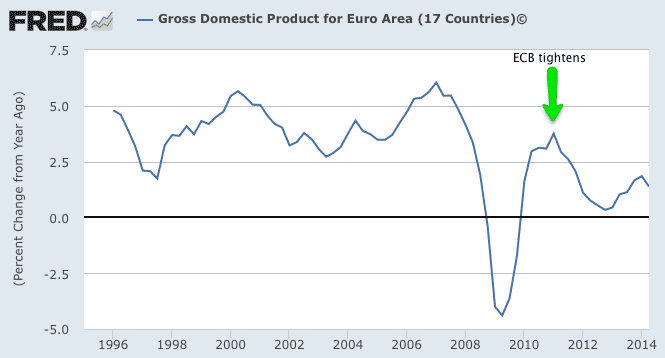 The next chart is Euro-area GDP growth, which is barely positive and has been heading lower. There is nothing nefarious about central banks lowering rating within this fundamental environment. More to the point, Gundlach refers to the prospect of raising rates when growth and inflation are this weak as "a big mistake." He has more than economic theory to support his view. Bowing to political pressure, the ECB raised rates, twice, in 2011. The impact on demand can be seen above, and the impact on inflation can be seen below (arrows). In summary, then, low growth and inflation, both in the U.S. and abroad, fundamentally support low rates. That fund managers believe they should be higher reflects their frustration at being unable to earn a higher return on their investments. That's understandable but the benefit of lower rates on the macro environment far outweigh the disadvantage of lower investment returns for fund managers. That's the trade-off. We'd all prefer to have both higher macro growth and higher fixed interest investment returns right now. Fund manager's views on rates probably also reflects a recency bias: rates were higher the last 40 years, therefore current rates appear to be unnaturally low. (Side note: the bond fund manager quoted above bet against falling treasury yields in 2011. That didn't go well). What about the claim that low rates "cripple those that now depend on a reasonable interest rate to produce an equitable amount of interest income?" There is no doubt that low rates hurt savers. 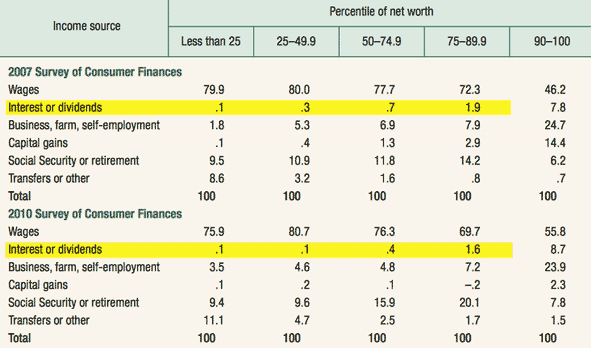 The rub is this: relatively few Americans have any savings on which to earn interest income. Even in 2007, when 10 year yields were almost 3 times higher than today, interest income was less than 2% of the total income for 90% of American families. In other words, those who could reasonably be expected to earn interest income of any significance also have a large principal on which to live or use in retirement. 90% of the country are, regrettably, not in that group. Instead, most Americans are net debtors. For them, lower interest rates increase their disposable income. Should inflation increase, the real value of their debt would also decline. Conversely, disinflation and outright deflation lowers disposable income and also increases the value of debt. None of this is to minimize the impact of low rates on savers. But, all things considered, the benefit of lower rates is heavily skewed in favor of the economy at large and 90% of Americans. Like low investment returns, there is a trade-off. We'd all prefer to have both higher growth and higher interest income right now. A final point. Low rates have been the center of criticism by the investment community for over 6 years. According to fund managers. it was supposed to lead to hyperinflation, a crashing dollar, a rush into gold and, ultimately, a deeper recession. None of these things has happened. Low rates are now criticized for other reasons. Meanwhile, under a policy of low rates, the U.S. has become the economic engine for the rest of the world. There are always tradeoffs. Look around the world and it's clear that, on balance, the benefits of low rates have far outstripped the disadvantages.